For the 1974 model revision, the Porsche 911 received a major overhaul that distinguish the new G-model from the earlier models. New bumpers were required by US law, the vents below the headlights disappeared (with the turn signals being moved into the bumper), and the whole body was slightly redesigned and appears more muscular. The engine was a 2.7l. The Turbo was introduced in 1974. It differed enough from the 911 to receive its own internal development code, 930. It really is a model of its own and not considered here further. 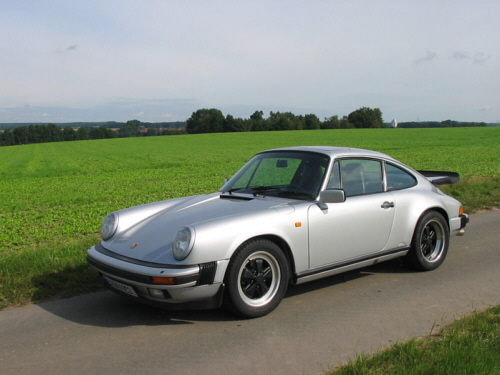 Engine displacement on the naturally-aspirated models was increased to 3.0l in 1978 (SC model), and 3.2l in 1984 (Carrera). Looks stayed practically the same throughout the 15 years of production, as Porsche had plans to drop the 911 with its outdated air-cooled rear-engine layout in favor of the 928. As it turned out, the 911 continued to be popular beyond expectations. A new model was finally introduced in 1989, the 964. The early 911 and 911S with the 2.7l engine have 150-175hp. The SC kicked this up a notch, with 180 to 204 hp in a car with a dry weight below 1,200 kg. The ultimate 911 G-model, the 3.2l Carrera, has 231 hp, leading to a top speed of 245 kph and a 0-100 time of 6.1 seconds. The 911 G-model is the cheapest way to drive a classic air-cooled Porsche 911. Even though it is more affordable than the earlier models, the G-model isn’t exactly cheap either. Especially the 3.2 Carrera is sought after and expensive. Other cars of the same era offer more power and room. It;s a Porsche, so maintenance isn’t exactly cheap. Rust can be an issue. 3.0l SC, best bang for the buck.